What is a K-1 Form? S corporations, partnerships, and LLC's are considered pass-through business types because the income of the business passes through to the owners on their personal tax returns. In these businesses, income tax returns are prepared by the business and then the net income (profit) or net loss (loss) is distributed to the owners according to their share. A K-1 form is used to report individual partner or shareholder share of income for a partnership or an s corporation. 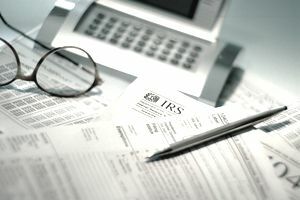 Items from the K-1 are transferred to the individual partner or shareholder's personal tax return. Single-owner LLC's don't use a Schedule K-1 to report the income of the business. This business type uses a Schedule C-Profit or Loss from Business. Schedule K-1 is used to report income, losses, dividend receipts, and capital gains of partners, or of shareholders of s corporations or from some trusts. The partnership Schedule K-1 is also used to show the distribution of income to members in a multiple-member LLC (which is taxed as a partnership). How Does Schedule K-1 Work With a Business Tax Return? To clear up the confusion, remember that the way the business is taxed depends on the business type. A partnership is not taxed on its income; instead, the individual partners pay tax on their share of the income of the partnership, based on their Schedule K-1. The partnership does file an information-only tax return - Form 1065. An S corporation pays tax on income and files a corporate return on Form 1120-S. The individual owners pay tax on income distributed to them as shareholders; this income is shown on Schedule K-1. As noted above, members of a multiple-member LLC receive income information on the partnership Schedule K-1. A single-member LLC is taxed as a sole proprietorship and the owner doesn't receive a Schedule K-1. How Do Schedule K-1's Differ for Partners and S Corp Owners? There are two versions of Schedule K-1, One version is for partners in partnerships (including multiple-member LLC owners),(Form 1065, K-1), and the other is for shareholders in an S corporation (Form 1120s-K-1). The major differences between the two Schedule K-1 forms are in how the income/losses and certain types of deductions are included. In a partner's Schedule K-1, the partner's share of the partnership income/losses and liabilities at the beginning and end of the year are required, as well as the partner's share of capital gains or losses. In a shareholder's Schedule K-1, the shareholder's share of income of different types, and of certain kinds of deductions must be itemized. On both types of Schedule K-1 forms, any self-employment income or losses from shares of the business must be entered, to calculate self-employment tax on Schedule SE. The Schedule K-1 itself is not filed with the personal return but is sent to the IRS along with the appropriate business tax form (Form 1065 for a partnership; form 1120-S for an s corporation). How Do I Enter Schedule K-1 on My Personal Tax Return? Information from Schedule K-1 is included the partner's or shareholder's personal tax return on various schedules, depending on the type of income. Most types of partnership income are entered on Schedule 1 (2018 and beyond) of the 1040 form. What Information is Included in a Schedule K-1? Schedule K-1 for a Partner. The K-1 information is based on the partner's share of the relevant information from the partnership tax return (Form 1065). Schedule K-1 for an S Corporation Shareholder. The K-1 information is based on the shareholder's share of the relevant income/loss items from the s corporation tax return (Form 1120-S). As you can see, Schedule K-1 is complicated, and it may take an expert to calculate each owner's share of the business profit or less. Get the help of an experienced tax professional to make sure the form is completed correctly.